I thought I would take a break from the flowers for a bit and try my hand, or should I say my brush at a seascape :) The colors are a bit subdued online as the warm sunset is much richer in life but it is close. 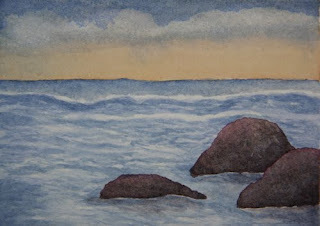 I loved painting all the texture on the rocks and I am quite happy with how they set off the sky and the water. This is another miniature measuring 3x4" for the actual painting on a 5x7" piece of Arches watercolor paper. I will have to frame some of these miniatures and take a group photo as they will look really cool all in a grouping. I plan on taking several of these to the Farmer's Market next Sunday so I guess I better get busy!